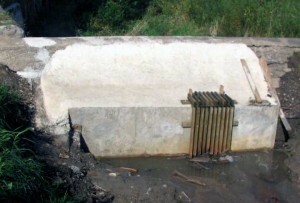 Here is a photo of the the dam on the upstream side…..finished. I added the trash rack to catch ….trash. It didn’t work out because it kept getting too much trash and stopped the water. When we took it out it looked like it was nearly worn through. When we looked a little closer there was teeth marks. A beaver was eating his way through the wood. ! ! Now it runs better and only the big logs get caught in it. I plan to build a new trash rack that will look something like a cow catcher on a train. Maybe it will work better.